Marcy, Bedford–Stuyvesant, Brooklyn, New York City, New York, U.S.
Malik Deshawn Cox (born June 23, 1978), better known by his stage name Memphis Bleek, is an American rapper and actor, mainly known for his tenure with Roc-A-Fella and CEO of his own labels Get Low and Warehouse. He has released four albums during his career (2 of which went Gold by the RIAA), and had planned to release The Process in 2011, although the album has yet to be released. Memphis Bleek was one of the first artists signed to Roc-A-Fella Records, as protégé to Jay-Z. He grew up in Marcy Projects, the same neighborhood as Jay-Z. He appears on the Jay-Z albums: Reasonable Doubt, Vol. 2... Hard Knock Life, Vol. 3… Life and Times of S. Carter, The Dynasty: Roc La Familia, and The Blueprint 2: The Gift & The Curse. Bleek's first official appearance was "Coming of Age" from Reasonable Doubt. After the huge success of Hard Knock Life and the exposure of the Roc-A-Fella camp, (a Memphis Bleek track off the aforementioned Jay-Z album, "It's Alright", actually charted on Billboard), the label released Memphis Bleek's debut album, Coming of Age. The album was the week's Hot Shot Debut on the Billboard 200, peaking at #7 with 118,000 units sold in its first week. The name "Memphis", which the rapper explained to pay homage to pimps, was an acronym for "Making Easy Money, Pimping Hoes In Style". He has released three more albums since his debut, The Understanding, M.A.D.E., and 534 (Out of the three, The Understanding was certified Gold by the RIAA). In between the release of The Understanding and M.A.D.E., he took a three-year hiatus, in which time he took care of his older brother, who was seriously injured in a motorcycle accident. There are three significant notes to take away from the album 534, which was named after the building number where Memphis and Jay-Z grew up in the Marcy Projects. First, it was the first release from the "new" Roc-A-Fella Records, referring to Jay-Z becoming President of Def Jam. It was also the first official Def Jam recording by label mate turned international star, Rihanna, on the song "The One". And lastly, this album marks where Jay-Z released his first song since beginning his brief "retirement". The song was called "Dear Summer", in reference to what Jay called the time of the year when he would drop a classic album or single every year for eight straight years, and how he had to metaphorically leave "her", Summer. His highest charting single was "Is That Yo Chick", Featuring Missy Elliott and Jay-Z, which peaked at #7 on the Hot Rap Singles Billboard Chart, and only one of two songs by the artist to crack the Billboard Hot 100, peaking at #68, and the only track to appear on one of his solo albums. The other single being "It's Alright", appearing on the Hard Knock Life album by Jay-Z, peaking at #61 on the Billboard Hot 100. He has had countless collaborations with fellow hip-hop artists such as DMX, Ja Rule, T.I., and Trick Daddy, with many of the features coming with other Roc-A-Fella artists, including Beanie Sigel, Freeway, Cam'ron, Amil, Young Gunz, and of course Jay-Z. In fall 2005, Memphis Bleek told MTV that he was recording an album called The Process, that he would describe as a make or break album, saying "I want to do an album that's through the roof, I want to do a classic album. I feel that if this album I'm not recording is a classic, I'm not even gonna put it out. I have to do it bigger than anybody has ever done it. I have to make a good record this time, not just talking-junk records." The rapper has worked on the album since 2005 and during that time frame he would release the songs "Hustla", "Get Ya Money Off" and "Let It Off". During this time, he would also leave Roc-A-Fella after Jay-Z told him he could run his own company and had the proper distribution deals to do so. He found a new home in 2009 when he signed to Mass Appeal Entertainment. In the summer of 2010, he was on stage with Jay-Z, as a background singer, in the Swedish festival Peace&Love. On June 6, 2012 Memphis Bleek working with The Liberty Music Group released "KG Vol. 2". The release went on to garnish over 59,000 Downloads and get a 3/5 Review from XXL Writer Adam Fleischer. On April 10, 2012 Memphis Bleek working with The Liberty Music Group re-released "The Movement". The release went on to garnish over 125,000 Downloads. On March 21, 2014 Memphis Bleek released "The Movement 2" a mixtape for free download. On December 13, 2014 Memphis Bleek married longtime girlfriend, Ashley Coombs, in an evening ceremony at The Merion in Cinnaminson, New Jersey. Bleek's mentor and hip hop mogul, Jay Z, was in attendance. Bleek is also the cousin of fellow Brooklyn rapper Sean Price. Getting the thumbs up from Jay-Z to give Memphis Bleek his own label as CEO and founder of Warehouse Music Group. The debut release from the label was Memphis Bleek single "So Different" featuring Manolo Rose that created a big buzz for the label. On July 28, 2016 Memphis Bleek made the announcement of signing Manolo Rose and Casanova. In 2017, Manolo Rose releases "Ball Drop" and "Pink Fur". Casanova releases three big singles "Don't Run", "Go Best Friend" and "Left, Right" featuring Chris Brown and Fabolous. In 2002, Memphis Bleek starred in State Property as "Blizz". Also in 2002, he was in Paper Soldiers. Memphis Bleek is a playable character in the video game Def Jam: Fight for NY. ^ "Everyday". warnerchappell.com. Warner Music Group. Retrieved 2017-10-15. ^ "Memphis Bleek". Blackhistorydaily. 9 May 2014. Retrieved 22 March 2019. ^ Jay-Z Album Discography | CDNow. Amazon.com. Retrieved on 2013-01-26. ^ The Boy are back Atop the Top 200. Billboard.com. Retrieved on 2013-01-26. ^ M.A.D.E. in America. Billboard. Retrieved on 2013-01-26. ^ Memphis Bleek Brings It All Back Home. Billboard.com. Retrieved on 2013-01-26. ^ Reid, Shaheem. (2005-05-10) 'Retired' Jay-Z Releasing New Track Via Memphis Bleek LP. Mtv.com. Retrieved on 2013-01-26. ^ Reid, Shaheem. (2005-09-20) Memphis Bleek Helps Jay-Z Prepare For War – News Story | Music, Celebrity, Artist News | MTV News. Mtv.com. Retrieved on 2013-01-26. ^ Kuperstein, Slava (March 20, 2009). "Memphis Bleek Talks Leaving Roc-A-Fella". HipHopDX.com. Retrieved 2008-08-21. ^ "Memphis Bleek – The Process (Album Cover) | HipHop-N-More". Hiphop-n-more.com. 2009-12-30. Retrieved 2012-03-30. ^ "Memphis Bleek, Kush Vol. 2". Retrieved 2015-09-05. ^ "Memphis Bleek - The Movement". DatPiff. Retrieved 2015-09-05. ^ "Memphis Bleek The Movement 2". OrangeMixtapes.Com. March 21, 2014. Retrieved 2014-03-21. ^ Ahmed, Insanul. "Quote of The Day: Sean Price and Memphis Bleek Are Cousins". complex.com. Complex Magazine. Retrieved 2015-09-20. ^ Louie, King (2017-02-21). "Memphis Bleek On The Rocafella Breakup, Gassing Jay Z & Nas Beef & Being Warehouse Music Group CEO [VIDEO]". Hot 97. Retrieved 2017-11-25. ^ "New Music: Memphis Bleek x Manolo Rose "So Different"". Rap Radar. 2016-01-08. Retrieved 2017-11-25. ^ "Memphis Bleek & Manolo Rose Drop "So Different"". Insomniac Magazine. 2016-01-08. Retrieved 2017-11-25. ^ "Rap Radar Podcast: Memphis Bleek, Manolo Rose, & Casanova". Rap Radar. 2016-07-28. Retrieved 2017-11-25. ^ "Memphis Bleek Talks Jay Z Giving Him A Label To Sign Manolo Rose & Casanova". AllHipHop. 2016-02-21. Retrieved 2017-11-25. ^ C.M, Emmanuel. "Manolo Rose Throws a Wild Party in "Ball Drop" Video". XXL. Retrieved 2017-11-26. ^ "New Music: Manolo Rose "Pink Fur" (Prod. By Childish Major)". Missinfo. Retrieved 2017-11-26. ^ "Buzzing Brooklyn Rapper Casanova Says "Don't Run" In New Video". AllHipHop. 2016-06-10. Retrieved 2017-10-20. ^ "Casanova - "Go Bestfriend"". Thisis50. Retrieved 2017-11-26. ^ Wza, Tat (2017-10-27). "NEW MUSIC: Casanova Ft. Chris Brown & Fabolous - Left Right [AUDIO]". Hot 97. Retrieved 2017-10-28. 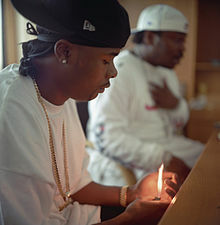 Wikimedia Commons has media related to Memphis Bleek. This page was last edited on 15 April 2019, at 00:07 (UTC).